I was looking to upgrade my home safety and searched the Internet a lot. The best solution I’ve found on the market were smart locks. Smart locks are connected to a mobile phone via Bluetooth or Wi-Fi, and you can control the lock remotely. No hassle with looking for your keys with hands full of groceries when you return from shopping. You can also open the door to a delivery person without explaining to him where the hidden key is. You can enable friends and family to enter the home to feed your dog while you are on a business trip. But I wanted a bit more security, so I looked for a smart lock with an integrated camera. With this kind of lock, I would see who is out the door, even when I am away. Isn’t it great? 1 Are there smart locks with the integrated camera? 2.2 What’s in the package? 3 US:E – Camera Equipped Smart Lock with Facial Recognition by Elecpro Group Inc.
3.2 What’s in the package? 5 What are other options? Are there smart locks with the integrated camera? Yes, finally they are here! All smart home fans awaited for smart locks with an integrated camera for a long time. Today, Gate Labs, a US startup, is manufacturing Camera Smart Lock, US:E – Camera Equipped Smart Lock with Facial Recognition is produced by Elecpro Group Inc., and Latch, a startup founded by Apple alums in 2013 announced to start the production of the M-Series Smart Lock which will have integrated camera. Camera Smart Lock is the first smart lock equipped camera in the world. It is the result of creators’ desire to make life more connected, safe, convenient and comfortable even when people are not at home. The lock is easy to install. It replaces the traditional key lock, and easy to do it yourself, with a screwdriver provided in the package. It fits all standard exterior and interior doors, and you can install it easy if your entry has separate deadbolt and door handle. If the deadbolt and handle are combo lock, then you will need to get a separate door handle. Unfortunately, you will not be able to replace the traditional lock on the Mortise lock with Camera Smart Lock. The only thing left is to download the application from Google apps and to connect the mobile with the smart lock. 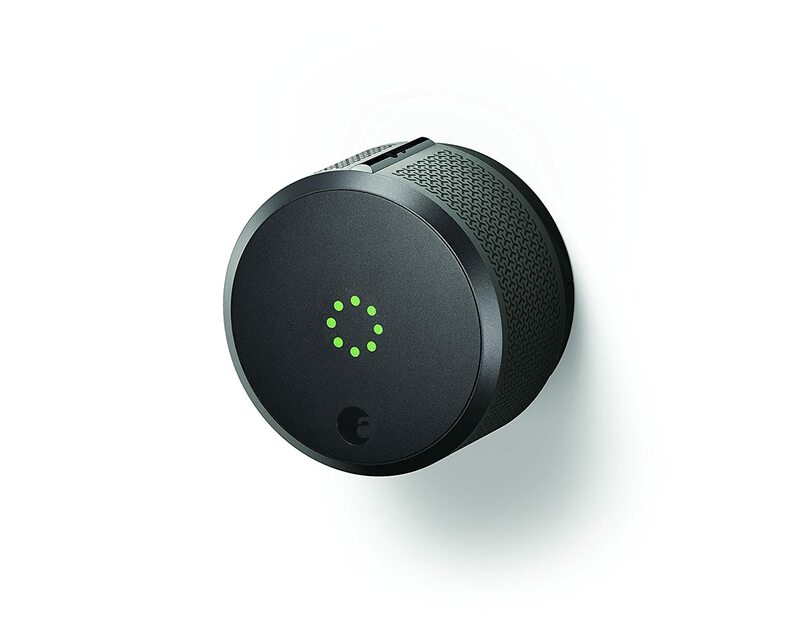 You will get all you need to DIY installation in the package: a rechargeable lithium-ion battery, a charging cable, and a screwdriver for removing your traditional deadbolt and installing your Camera Smart Lock. You will also find spacers for a custom fit in the package, in case your door is thinner than standard. The Camera Smart Lock is actually an all in one smart gadget for home security. It replaces smart doorbell, smart lock, and smart security camera. The camera is motion activated so it will make a capture or a video whenever a movement around the door is detected. There is a two way audio in the lock, so if somebody is at the door, you will see who it is, and you can talk to the person from your mobile. The lock has built-in Wi-Fi and it automatically connects to your home internet, and automatically updates and uploads video. After a 30 days free trial, with a premium package, you will have 30 days of video recorded. The rest of the features are same as in other smart locks: you can unlock the door remotely, enable access to reliable persons by providing them with a PIN, or let the delivery boy inside, while you are away. Additionally, you will be notified about all movements around the door via mobile, like smart cameras with motion detector do. The all-in-one Camera Smart Lock will enrich your home with three smart gadgets and improve its safety in one purchase and easy installation. Currently, this smart lock is available for shipping only in the US. 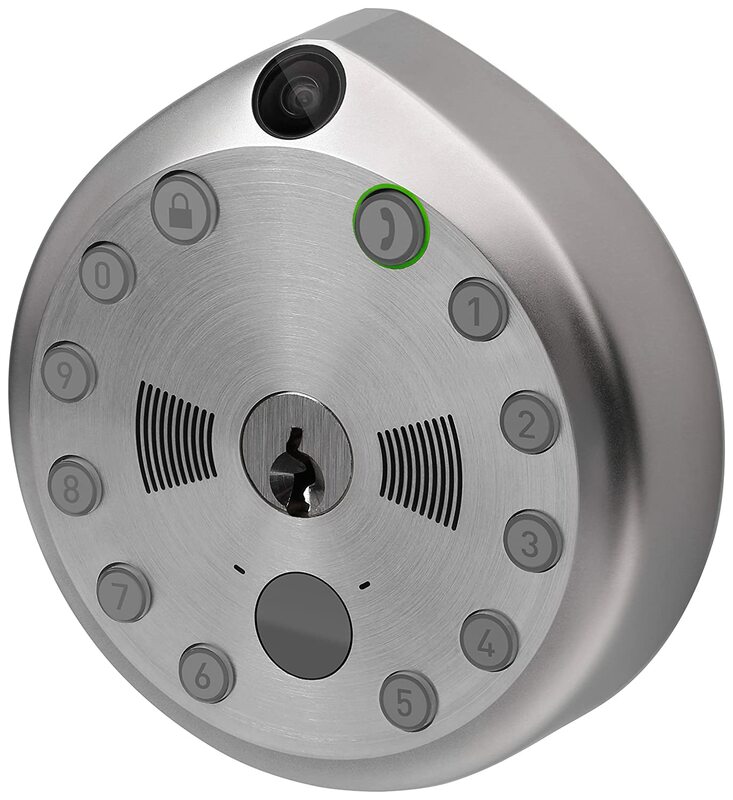 US:E – Camera Equipped Smart Lock with Facial Recognition by Elecpro Group Inc. The idea of creators of this smart lock is to create a smarter and safer lock. It seems to be much more advanced than the previous brand, but let’s check out what are the features and advantages of US:E smart lock. Installation is easy, and the only requirement is to have door 30-45mm thick. It is suitable for wooden, bronze, anti-theft and aluminum doors. The installation consists only from replacing the traditional deadbolt with the US:E.
As screws are standard, you can use the screwdriver you have. The application is easily accessible and straightforward. With US:E smart lock you are enabled to open the door in many different ways: Smartphone, Password, Fingerprint scanning, Key Fob, Physical key or Facial Recognition. You can also choose between facial recognition version and password version, whichever suits you better. It has doorbell implemented, together with many other features. The face recognition technology works well during both day and night, as it has advanced Infrared 3D recognition technology and a 4-level A.I. recognition. This biometric facial recognition technology allows you to unlock your door only by looking at the camera. Up to 100 faces can be memorized by the US:E smart lock. The number of fingerprints this lock can save is also 100. If you order the facial recognition version, you will also have the possibility to open the door by palmprint recognition. Same as Camera Smart Lock, you can unlock the door from mobile, and check who is at the door, and open it if needed while you are away. If you wish to use coded entrance, there is a security system available if you suspect that somebody is secretly watching you typing. All you need to do is to type in random numbers before or after your code and the lock will still open, without revealing the code. You can also make double verification by combining two ways of unlocking. The release and shipping worldwide should start in May 2019. The price will be much lower than the cost of Camera Smart Lock, especially for early birds. Latch plans to launch the M-Series Smart Lock, which will be enterprise focused smart lock. It is dedicated for business owners and landlords, to enable them keyless access to customers, employees, and tenants. It has a classic deadbolt together with the touchscreen and sensor for NFC-equipped card. Implemented wide-angle camera which will be movement sensitive will take a snapshot every time a person uses the lock. This smart lock will be connected via Bluetooth. This smart lock is not released on the commercial market, it is available only for building owners that purchase a minimum of 10 pieces, with a 2-year service commitment. The “M” in M-Series is for Mortise type of the deadbolt which is designed to separate the latch from the cylinder, and that is what makes this smart lock unique and opens the door to market growth in this area. None of the above brands are famous, but with the unique product they are offering on the market and innovations they have introduced to smart lock world, they will be the topic at many smart home forums soon, for sure. Smart Lock with Camera currently has only a small part of the market of smart locks. It will expand for sure. But until then, there are some combinations and kits available for those who want to secure the home, and smart lock with the camera is not available. The best combination of a smart lock and a smart doorbell with the camera is August Smart Lock + August Doorbell Cam Pro. August merely is at the top of smart home security, and you can be sure that your home is secure if you combine August Smart Lock and Doorbell. With a few new features, and even this smart lock looks significantly different from the first two versions August Smart Lock, 3rd Generation is a more affordable option, but also more comfortable to install and more secure. It has door sensor functionality so it can track if your door is left ajar and send you an alert to the mobile. All you have to do is to install an included magnet in the door frame or on the lock. You can send permanent, recurring and temporary keys to your guests via the mobile app. This smart lock has an auto-unlock feature, which like geofencing – track when you get close to home and unlocks as you approach the door. It also auto-locks your door when you leave. August Smart Lock 3rd generation is compatible with Amazon Alexa, Google Home, Wink, Nest, Xfinity, Logitech Harmony, and others. Lacks of this lock are that it doesn’t have an alarm nor it detects when someone tampers with a bolt or tries to force the door open. But if you combine the lock with August doorbell cam, you will have the same experience as with smart lock with an integrated camera. The installation for this hardwired doorbell takes only a couple of minutes, and instruction is straightforward. The camera covers the entire doorstep as the angle of the lens is 120 degrees. August doorbell cam has a motion detector, excellent HD video quality, and clear two-way audio. August doorbell cam is compatible with Alexa so you can well combine the smart lock and doorbell with the camera. The camera has an excellent resolution, 960p by 1280p in portrait mode; however, it doesn’t rotate if you flip your phone around. One of the cons of this doorbell is that it is hardwired doorbell and has no backup battery, so in the case of electrical break down, it will not work. Also, you need to have light in front of your home because the doorbell isn’t equipped with the necessary infrared LEDs for night vision. This camera doesn’t have video detection, it is based on an infrared sensor, which is sort of good, as you don’t get false notification caused by passing cars. Of course, other brands are available for combining the smart security gadgets, whether you are a fan of Ring or Arlo there are different options to make the best out of them. For example, you can combine Ring Video Doorbell 2 or Arlo – Wireless Home Security Camera System with the smart locks even from other manufacturers, all you need to take care about is to be Alexa compatible. Currently, the only security kit with smart lock available on the market of smart gadgets is Z-Wave Electronic Deadbolt / IP Camera / Wireless Combo by Toledo. This includes a smart lock and camera combination. Toledo is an international company which is known in USA Territories and South America for its locks, padlocks, and hardware for residential and commercial spaces. The door can be 60 – 70 mm thick and the lock is suitable for both wooden and metal doors. The smart lock can be remotely accessed via the Mobile application, like other smart locks, and other features are pretty similar. There are some advantages such as touchpad which prevents fingerprint code detection which is possible to do on button keypad lock. You can create 4-10 digits password, and you can give access to up to 30 persons. 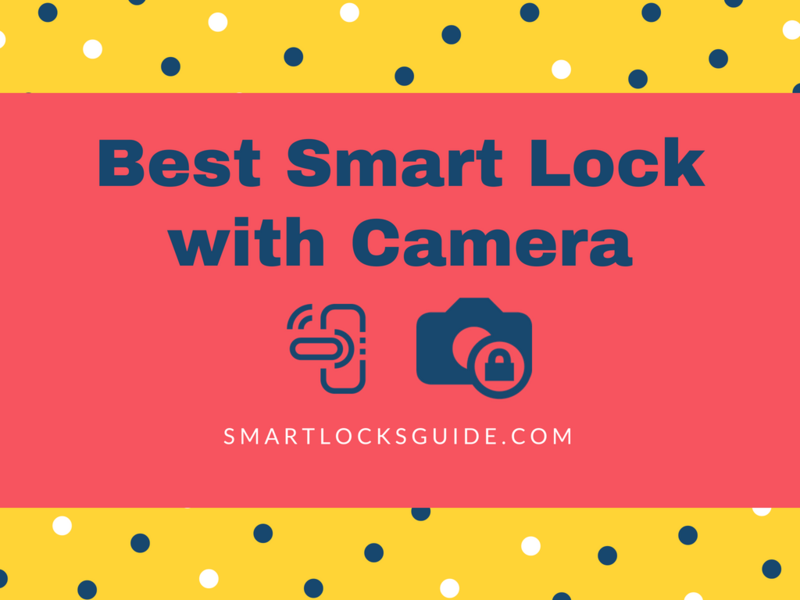 The lock and camera connect via Z-wave and are also Alexa compatible. The camera is not really an exterior camera, but this kit is suitable for situations where someone is home alone for a long time during the day, like old parents or teenage kids. You will want to check up on them. The security aspect must not be forgotten, as you can also do entrance door surveillance with this camera. The camera is full HD with resolution 1080p and 110-degree lens angle. It has two-way audio so you can communicate with the person on the other side of the camera via mobile. IR system allows the smart camera to work well both day and night. 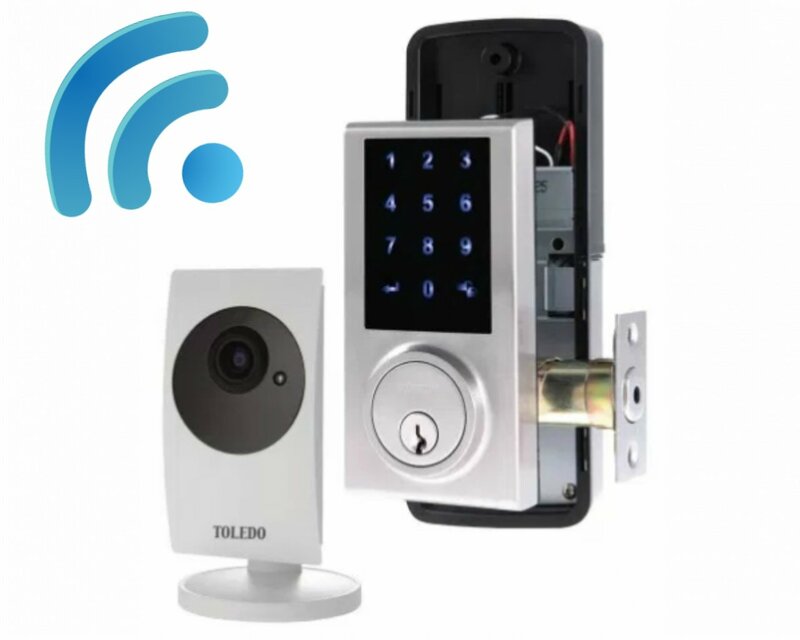 This kit provided by Toledo increases the home security and is the only kit that combines smart lock and smart camera on the market, available also on Amazon. Hopefully, after reading a couple of suggestions, it will be easier for you to swim in the turbulent market of smart locks with camera, whether you prefer to use a famous brand such as August, Ring or Arlo, or you decide to stick to smaller startups that are still babies on the smart home gadgets market.